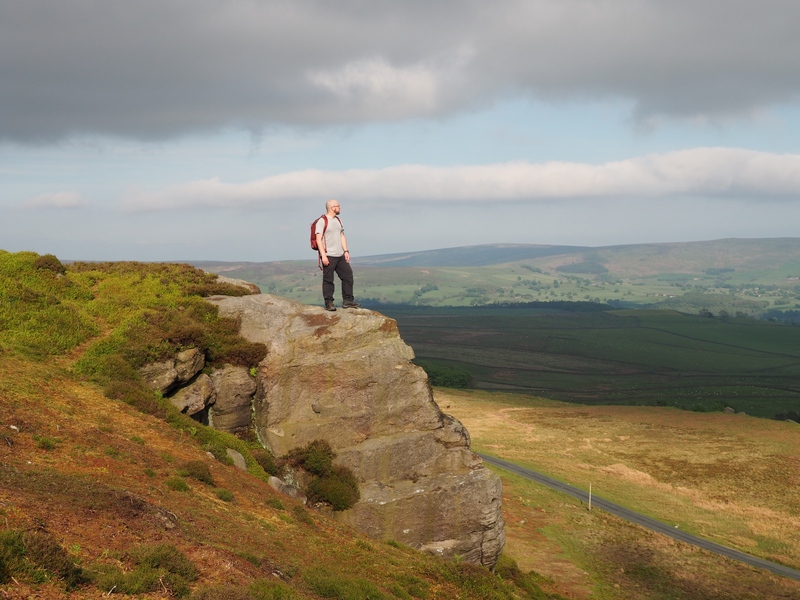 A pleasant evening walk visiting High Crag and Brown Bank, two of the minor summits on the sweep of moorland between Bolton Abbey and Skipton. I do like the long evenings of late spring and early summer. It provides ample opportunity for post-work evening walks and if lucky the chance of a sunset. Generally I tend to stick to places within 30-40 minutes drive from home and one of my favourite places for an evening walk is the large expanse of moorlnad between Bolton Abbey and Skipton. On this occasion I decided to revisit two of the lesser known tops on the moor, High Crag and Brown Bank. I started from the parking area immediately above a cattle grid on the road from Barden Tower to Eastby and Embsay. Eschewing the most direct approach on to High Crag, also labelled on maps as Halton Height, I took a track immediately opposite the parking area heading south above How Gill. Descending slightly the path then turned right to pass below the gritstone outcrops of Low Crag before climbing back up to the road again. Crossing the road I took a faint path climbing up to a broader grassy path slanting up below the outcrops of High Crag. One particularly striking rock had the profile, at least from below, of something from the Easter Islands. Rather than continuing up alongside the wall I zig-zagged up to this rock to gain the main edge. After a brief exploration of the top of the crags I then made a beeline north to the summit cairn and trig point. After taking a few photos at the top I made my way on a thin path back to the wall which runs along the top of a wood. Here a followed a thin path heading west above the wall for the next mile and a quarter, passing Eastby Gate, crossing Heugh Gill and eventually joining a path heading north on to the moor from Embsay. All along this stretch there were some fine views of Skipton Moor to the south as well as Skipton Quarry, the workings of which are well hidden from motorists on the A59. Resisting the temptation to make a detour on to the neat top of Embsay Crag I took the thin path heading north across Embsay Moor heading for Brown Bank. For the next mile or so the path climbed ever so gently towards Brown Bank. Unfortunately, my arrival coincided with a large bank of cloud blocking out the sun. I wasn’t in any rush, so I sat below the large boulder that marks the highest point, ate my lunch and enjoyed the views. From Brown Bank the return was simplicity itself, a simple case of joining the wide bridleway heading east and following it all the way back to the parking area. While it stayed cloudy for most of this final stage of the walk I did enjoy a brilliant though brief burst of golden late evening sunshine. These five minutes alone made the entire walk worthwhile.